Infab Corporation is a Food and Drug Administration (FDA) registered Medical Manufacturing establishment. Accordingly, all our radiation protection aprons and gloves are manufactured utilizing Good Manufacturing Practices as mandated by the FDA. In addition all Infab Corporation radiation protection aprons and gloves are CE certified and carry the CE mark designation. All Infab Corporation aprons are manufactured from the highest quality and purity materials. Aprons are constructed from multiple layers of material and are available in a wide range of attenuation levels. Infab Corporation tests each batch of our core material in the direct beam at energy levels of 80, 100, 120 and 130kVp. Other testing ranges can be performed by special request. We test the attenuation level of 1, 2, 3 and 4 layers of protective material and these results are available on request. 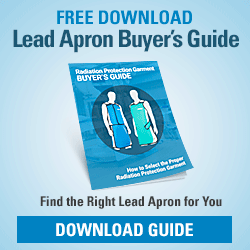 Vest and Skirt and all aprons with overlapping front panels are manufactured with two layers of protective material in the front panel with the pocket and a single layer of protective material in the opposite panel. Therefore, it is imperative that the apron fits properly and fully overlaps the body from side to side. As aprons are manufactured in a variety of sizes and Infab cannot monitor who is wearing what apron, it is the end users responsibility to insure the proper fit. When testing for lead equivalency and attenuation of Infab aprons please be sure the panels are fully overlapped to obtain an accurate reading. All protective aprons are not created equally. If in doubt, please ask your supplier of choice for current testing info and be sure you understand it fully before making a purchasing decision. It is always best and Infab Corporation highly recommends that someone with knowledge of radiation protection perform the ASTM test on ALL protective aprons in your facility and that the weight versus attenuation level be carefully evaluated. Infab Corporation is happy to supply you with any testing information or to assist you, answer questions, build you a customized product or connect you directly with an independent health physics lab in an effort to insure you are getting the radiation protection that is correct for you and your facility. Aprons are available in a variety of standard sizes and custom sizes can be manufactured to your dimensions. Care should be taken to insure you are wearing the proper size and that all critical areas are covered fully. Gloves are manufactured from a one piece mold. There are no seams or folds or radiation leakage like other gloves. Gloves attenuate 100% of the direct radiation beam at 80 kVp and are rated at a minimum of .50mm at 120 kVp direct beam. Gloves are one size and have ample length to cover 15” measured from the finger tip to the cuff. They have superior manual dexterity and are easily slipped on and off. All radiation protection aprons and gloves should be regularly checked and monitored for substrate integrity. Infab recommends a minimum of two inspections annually. Any protective apron or glove that shows holes, tears or radiation leakage must be taken out of service immediately and either repaired or destroyed. Aprons should always be properly hung on a rack or hanger specifically designed for protective apron storage. Never fold, crease or stack an apron. Avoid sharp objects. Core material is fragile and once punctured renders an apron unusable. Gloves, due to the nature of the mold, can be stored in almost any manner without causing damage. Care should be taken to avoid sharp objects as through and through punctures will allow radiation to pass to the wearer. Use only warm water and mild detergent or our specially formulated “Scrubbles” apron cleaner. Never use harsh chemicals and never use commercial or machine washing or drying on aprons. Glove liners can be removed and hand washed, then hung up until dry. Replacement liners are also available at a nominal charge. NEVER use a steam autoclave as the heat will cause severe damage to the protective substrate. Aprons and gloves can be ETO gas sterilized or disinfected with Clorox Hydrogen Peroxide Spray or Wipes.